In finance volatility is a measurement of the fluctuations of the price of a security. It is essentially an analysis of the changes in the value of a security. It is one of the most key measures in quantifying risk. A measurement of historic volatility looks at a security’s past market prices. Implied volatility is determined using the price of a market traded derivative. A security with high volatility means that its price can fluctuate considerably over a very short period (either up or down). In contrast, a low volatility means that the price of a security will not change dramatically in short periods of time. In business and finance, the term ‘volatility’ can also refer to fluctuations in interest rates, the value of a currency, market confidence, etc. It is the standard deviation from a specific continual compounded return over a certain period, or it is calculated as the difference between returns from the same financial instrument. A common method of calculating the relative volatility of a security to the market is its beta. 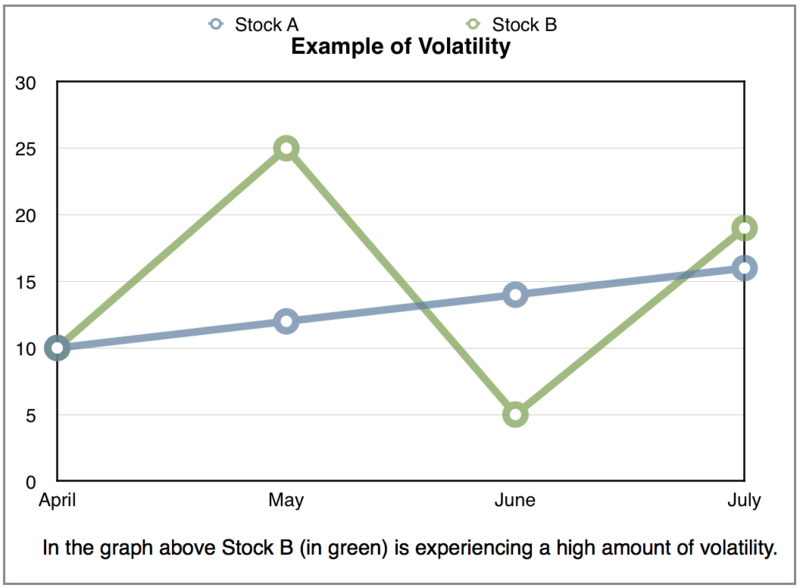 A beta determines the volatility of a security’s returns against the returns of a benchmark (typically an index such as the the S&P 500). For example, if there is a stock with a beta of 1.2, this means that it has historically shifted 120% for every 100% change in the benchmark. Similarly, a stock with a beta of .6 has historically shifted 60% for every 100% change in the underlying index. The volatility of a financial instrument can be determined by a number of different ways, and there are different types that investors commonly analyze. Over a period of one year, Company A’s shares were considerably more volatile than Company B’s. actual historical volatility – measured over a specific period of time with the last observation date being in the past. actual future volatility – measured over a period beginning in the present and typically ending at the expiration date of the security. historical implied volatility – uses the security’s historical prices. current implied volatility – uses a security’s current prices. future implied volatility – uses the future prices of the security. Science – evaporating rapidly, as in “acetone is a volatile solvent.” A group of compounds with low boiling points.